Beecham conducts Haydn, Mozart, Beethoven, Brahms, etc. Beecham caught ‘live’ often showed the mercurial side of his character and no performance was the same, either in the studio or in the concert hall. David Patmore confirms this in his booklet essay: ‘What Beecham sought at all times was freshness, and his unpredictability was a way to achieve this’. So here we have different and valuable alternatives to the studio performances. 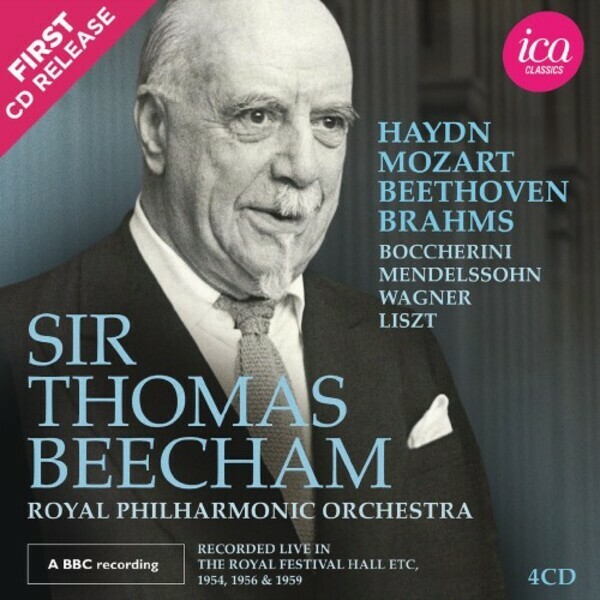 All the performances included here are from Beecham’s final years, between 1954 when he had fully established the Royal Philharmonic Orchestra and himself as central figures in England’s musical life, to 1959 where he conducted extraordinarily memorable accounts of Haydn’s Symphony No.101 and Brahms’s Symphony No.2. Every broadcast is captured here in exemplary sound for the time. Apart from Liszt’s Faust Symphony and Haydn’s Symphony No.101, none of the performances in this set have ever appeared on CD before as far as is known. Even the Beethoven Symphony No.2 recorded here at the Royal Festival Hall on the 14 November 1956 is different from the BBC Legends version recorded a month later in the BBC’s Maida Vale Studios on the 23 December 1956. This release has been sourced from the Richard Itter archive. After 12 years of negotiation starting in 2005, ICA Classics have signed an exclusive long term agreement with the Lyrita Recorded Edition who are responsible for Richard Itter Trust. The collection is very important for collectors because it has never been released before onto the market.